It’s time to take a look at an old asylum horror film. It’s not by the Asylum crew but it takes place in one and I can’t think of too many settings that are worse than this. Bedlam just isn’t the kind of place that you really want a film to take place in. The whole film is rather dreary and it can get rather dark for the inmates. While the film has a happy ending it does take a long while to get there and in the meantime there just aren’t many reasons to like this film. The characters can also be annoying and I’m basically spoiling my review here so lets get started. The film starts with a prisoner trying to escape Bedlam, but quickly being murdered by the warden. His name is George and he runs a tight ship around here. He is called in by the rich to explain what happened and George responds by showing the world how enslaved his prisoners are. The corrupt laugh at this spectacle and decide not to press charges, but one rich lady decides to put a stop to this. Her name is Nell and she decides to remodel the prison. George can’t have that so he has her arrested under guise of insanity and through Nell’s poor choice of words at the event she is found guilty. Nell is thrown inside the prison and must now try to communicate with them or she may not make it out alive. First of all, we have to look at how bad Nell is throughout the film. She doesn’t make a stand against the malicious practices of Bedlam until she is goaded into it by a Quaker. Once she does make a stand, she really doesn’t do a good job of it. She doesn’t enact any actual changes until she is in the prison. Before that she goes to court to prove that she isn’t crazy. You’d expect her to have a calm head on her shoulders as she answers questions without sass right? No, instead she is sarcastic to the council and insults them quite a few times. She refuses to answer their questions and admits to doing crazy things like eating money. Naturally the council banishes her. Sure, the council was definitely bribed here, but she made their job so easy. Why did she have to be so antagonistic right from the start? Then, Nell doesn’t even give the prisoners a chance once she is in the cage as she asks the Quaker for a weapon to defend herself. She considers the prisoners to all be savages and you wonder what happened to her lofty goals. Gradually the prisoners get her to join them in a game of cards and she realizes that they can be good. From here she is a good character who does make things better for the prisoners but it sure took her a while. I don’t blame her for not getting in the cage with the violent prisoner as that really could have ended pretty badly, but otherwise George actually had a point that she was all talk for a while. Naturally George isn’t a very likable main character as he plays the cruel villain role. He likes asserting his dominance over the criminally insane and as we saw with Nell, he basically chooses who he thinks is insane. A lot of these people may be innocent but apparently the whole town is rather corrupt. Everyone looks the other way when it comes to George but that does backfire on him in the end. His end definitely plays out as you would expect as there was no way that he was going to live through this. He had simply done too much by this point. Then we’ve got the Quaker. Unfortunately he is a very annoying character the whole time. He wants George to stand trial instead of being murdered by the inmates. A noble sentiment, but since he owns the town we all know that he would have gotten away scot free and then he would have murdered the inmates. The Quaker refuses to lift a hand to help anybody since he is a complete pacifist so it’s not like he would have helped to protect them. He comes across as oblivious to the world and rather naive. He could have been a good character, but they took him to the extreme and anyone could do what they wanted to him. It’s a shame since otherwise he probably would have been the best character here. The film never actually shows much so it isn’t all that violent or anything, but things definitely get rough for the characters. The prison implies as much violence as it can and the living conditions are certainly abysmal. There is also a parrot that gets arrested by the end and I don’t really like where that plot may have gone even if we didn’t see the conclusion. This just isn’t a good film and it drags on quite a lot. At the end of the day, the only way to fix the prison is to get rid of the head so if George wasn’t forcibly removed then it’s not like Nell would have actually fixed much. Given that he was going to experiment on her and nobody was going to stop him, it just shows how far gone the town is. Overall, Bedlam definitely isn’t a fun watch. While it has a happy ending, that’s only the final minute or so as the rest of the film can be rather dark. The only happy scenes before the ending are when Nell is talking tough to George, but she never ends up with the last laugh there. George is always one step ahead of her which severely limits how entertaining the scenes can possibly be. Prison films in general don’t tend to be great as even the Naruto film that dealt with this was one of the weaker installments in that series. I suppose at least some of the prisoners like the ex judge were fun characters. If you want to watch a good film about overthrowing a corrupt person in power…then you better start looking as I can’t think of a good one off the top of my head. Still, I’m sure that there are more than a few out there, you just have to know where to look. 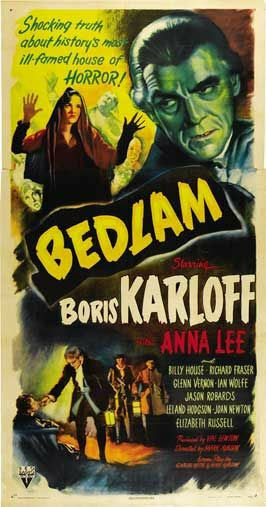 This entry was posted in Live Action Movie Reviews, Live Action Movies, Reviews and tagged Asylum, Bedlam, Boris Karloff, Film Review, Horror, Movie Review, Prison, Review, Suspense by dreager1. Bookmark the permalink.